I enjoyed reading Femina magazine for many years. I found it covered all areas – housekeeping tips, food, recipes, health, children, fashion, make up … basically anything that women identified with. It was not entirely a housewife’s magazine. It also covered modern issues, balancing home and work, career options, finance and so many other worldly happenings. Then slowly the magazine began to change. More pages on fashion and brands started to appear. Now I find it is like any other fashion magazine and not as a whole package to cater for women from all walks of life and different interests. I have tried many recipes from Femina magazine, picked up numerous tips and drooled over food photos. A salad recipe I tried out from the magazine became an instant hit with our guests. That led to me being invited by various communities and ladies clubs to give a demonstration on salads. 20 years down the road and that salad is still a favourite. 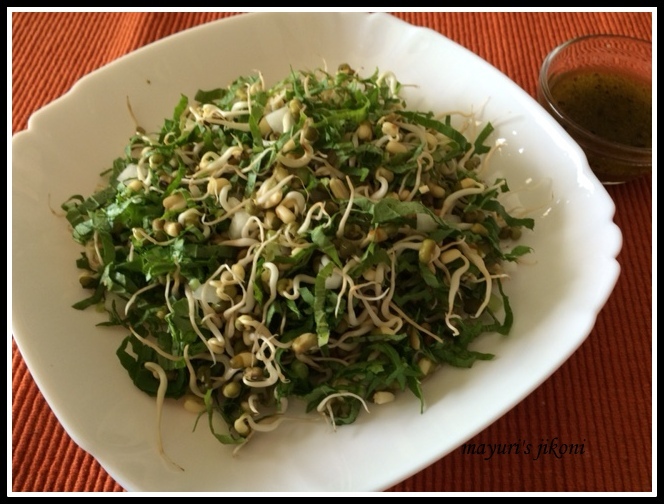 The favourite recipe is bean sprout and radish salad. During the month of Ramadhan, we get the freshest of the freshest radishes. Nice succulent radish with crisp crunchy leaves. Many of the Muslims break their fast with radish in Mombasa. I sprout the beans at home as we don’t get ready sprouted beans in the market here. Try out this healthy recipe. Which was or still is your favourite magazine? Put the sprouted beans, chopped radish, radish leaves and peanut powder into a serving bowl. To prepare the dressing, put all the dressing ingredients in a bowl. Whisk it till it appears slightly creamy. Add finely chopped onion if you like. Can add green chilli paste instead of the chopped chillis. Roast the peanuts and remove the skin before you chop them or grind them. You can use any vegetable oil or olive oil for the dressing. I used sunflower oil. I am guilty of never coming by here despite you being very regular on my space. 🙁 I am really sorry… I totally agree regarding old magazines… they have gone from good to becoming an advertising space for cosmetics unfortunately… I don't have any favorite magazine as such, whichever gives me a good collection of recipes, I just pounce on them! Hehe… The salad looks so refreshing… bookmarked! Did you know that you can create short links with AdFly and make cash from every click on your shortened urls.